Seen outdoors at the 2017-18 season opener hosted by Salisbury is Megan Carragher of Villanova University. It was the IHSA debut for Carragher and she won her intermediate fences class. 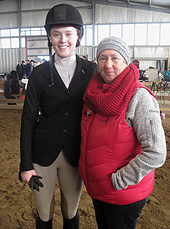 The sophomore from Stamford, Connecticut kept her season going on March 23rd, placing second in intermediate fences at Region 5 Regionals and thus earning a place in the division at Zones in Bloomsburg, Pennsylvania on April 7th. Seen indoors at Regionals on March 23rd are (from left) Caitlin Harris, head coach Amy Daspit and Lauren Paulsen of Salisbury University. Both riders competed in the large novice fences class that day (15 entries). 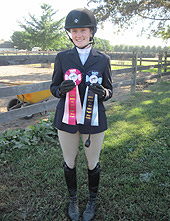 Harris, who is a junior from Dover, Delaware, would survive a four-way test (to select the top four as it turned out) and earn the red, second place ribbon and a trip to Zones two weeks later. 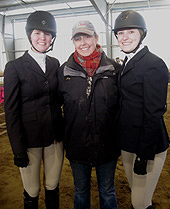 In her first season as head coach Brie Quinn (on right) nearly pulled Temple University into second place within Region 5. The Owls finished with 202 team points which was only five behind second place Drexel. One of the riders who helped Temple finish so high was freshman Willa Tise (on left). From Boston, Massachusetts, Tise pointed out of walk-trot-canter in her first season and was one of three Temple riders to compete at Regionals on March 23rd. The Drexel Dragons finished second in Region 5 for 2018-19 with 207 points. 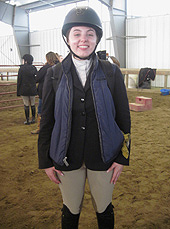 One of five Drexel riders to compete at Regionals was Madeline Hoffert (pictured). The sophomore from Coopersburg, Pennsylvania was third in individual novice flat, which was one of two flat classes that had to be split into heats thanks to fourteen riders being entered. 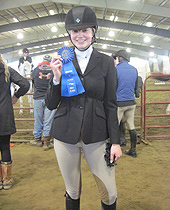 The other rider to place third in a class with heats on March 23rd was Shannon Finnegan of Washington College. Finnegan was part of an even larger class, as 16 riders were qualified in individual walk-trot-canter. From Ellicott City, Maryland Finnegan poses with head coach Megan Dixon (on left) and "Tali" following the class which brought her junior year to a close. The University of Pennsylvania had a 1.000 batting average at Regionals as Olivia Bruyn moved on to Zones in open flat. From Southampton, New York, Bruyn was the only member of the Quakers to compete at C-Line Stables in Odessa, Delaware (mapquest will say the facility is in Townshend, Delaware - Editor) on March 23rd and in that one division only. 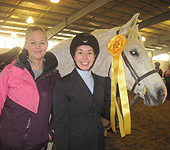 It would appear Bruyn won the class based on the ribbon she is holding, but this photo is coincidentally from another show at C-Line a year earlier when Bruyn won a similar blue ribbon. Region 5 holds a year-end banquet in the evening following their hunter seat regionals show where first and second place ribbons are officially announced. Therefore Bruyn knew only that she was going to Zones after competing but not if she was first or second until several hours later at the banquet. And yes Bruyn did win the class! They rode for different teams in the same class but share the same last name. From left to right are Rebecca Brown of the University of Delaware and Miles Brown of Valley Forge Military College. 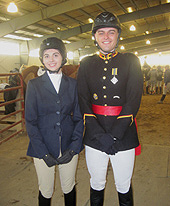 Each took part in the walk-trot class at Regionals (three riders competed in the division that day) and both survived to compete at Zones. At the banquet later that day Rebecca (from Drexel Hill, Pennsylvania) found out she was second while Miles (from Fort Lauderdale, Florida) found out he was the 2019 walk-trot champion. Though Rebecca Brown was second she can take consolation that her team won the region by a spectacular 142 points over runner-up Drexel and will send a full hunter seat team to Zones for the eighteenth time since 1995. Schools which competed in Zone 3, Region 5 during the 2018-2019 school year: Drexel University, Salisbury University, Stockton University, Temple University, University of Delaware, University of Pennsylvania, Valley Forge Military College, Villanova University and Washington College.